Before lunch, we went to back to the Petit Jean grave-site and Arkansas River Overlook to attend a program on the history of the mountain. Turns out, there are several theories behind the original inhabitants, explorers, and uses of the area, including this one, on the naming of the mountain. The most popular story is the one which I described in a previous post, and is also the one that appeals to our emotions the most. Since it involves explorers, French girls, summer nights, ghosts, graves, and Native Americans, it’s the one I’ll stick with. Anyhow, during the program, led by Park Interpreter B.T., we volunteered to be in a skit describing the ‘Legend of Petit Jean’. No, I didn’t play the cross-dressing French girl. But my wife did! 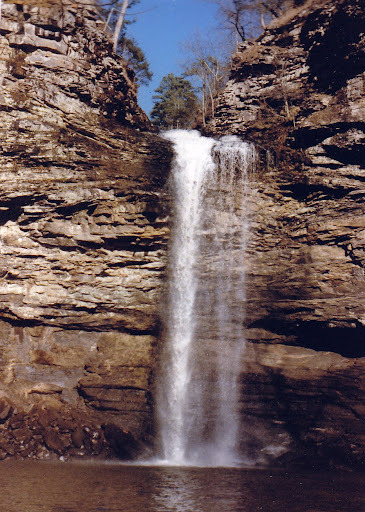 I played the part of Petit Jean’s boyfriend, and several of the other park guests played various explorers or Native Americans (who would say “Oh no, there goes the neighborhood” when the French Explorers arrived on the mountain). All in all, it was a fun program, and Joe really liked it. For the rest of the trip, we would randomly say “Oh no, there goes the neighborhood” and we would get a little chuckle out of it. People probably thought we were weirdos, but that is nothing new to this crew. After the Falls and lunch, we packed up our backpack, grabbed the hiking sticks and headed towards the Rock House Cave trail. This is another short, manageable hike that kids really enjoy. You start the hike by going down a geologic feature named “Turtle Rocks” and follow a short trail in the woods that leads up to a gigantic cave shelter. The shelter is a large rock formation that has 75 foot ceilings and little nooks and cranny’s that the kids love to explore. Joe had a great time, and wanted to stay at Rock House ALL day. We had to bribe him with a treat at the visitors center, and a promise to come back, to get him to leave. Later, we went to Bear Cave, which is another very fun, and kid friendly trail. Bear Cave is not actually a cave in itself, but a series of rocks that make it appear cave like. I believe it got it’s name when someone spotted a bear in there several decades ago. Joe really enjoyed this hike, there is more room to explore at Bear Cave, and if you are adventurous, you can climb the rocks about 40 feet, and have an amazing view of Cedar Canyon, with Mather Lodge off in the distance. I did the climb to the top on day three of our trip, but unfortunately, it wasn’t quite safe enough for Joe to come up with me this time. Leaving Bear Cave, we also got our first and only real boo-boo of the trip. Joe proclaimed that he was never going camping again (he discarded that viewpoint about an hour later). Winding down our day, we headed back to the visitors center (our new favorite watering hole), and finally, back to camp to get ready for dinner. That evening, we had some chicken fajitas w/all the fixins and some chips and dip. Another yummy way to finish the day. We didn’t do alot the rest of the evening, but at dark, we went to the amphitheater on the lake and listened to Park Interpreter Rachel tell different Native American stories, including “The First Fire’. Also, we did manage to hit the showers and get cleaned up before hitting the sack, which was an oh-so-welcome feeling.